I am pleased to add this cute hat pattern into the Cabbage Patch Kids doll clothes patterns range. I have received lots of requests from Cabbage Patch lovers who want the American Girl hat pattern I have available to be made bigger to suit the Cabbage Patch doll, so here it is. This hat has a lovely frill brim and has an elastic strap to hold it onto dolly’s head. 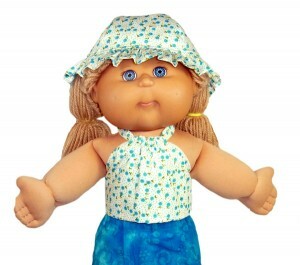 We all know how important it is to wear a hat to protect us when we go out into the sun so now your Cabbage Patch doll can be sun safe too! When you purchase this downloadable PDF pattern and written instructions, I will also give you LIFETIME access to video instructions streamed via my website where I show you step-by-step how to make this cut hat.